The ScrapMan system is based around a relational database. This database is designed to sit on any SQL based database engine (such as MS-SQL, mySql, Oracle etc). The schema for the tables used by ScrapMan are available from Mintspeed Ltd. This database holds, in real-time, all the information regarding the plant (trailers, cranes, tugs) and all work in progress (current orders being built, the target and actual weights of material in baskets). As part of the ScrapMan Manager installation, a suitable SQL based database engine is provided. Alternatively the schema can be implemented on an existing database installation at the customer’s site. Basket definition - empty weight, availability and current assignment. Trailer definition - Name of plant, IP address, current assignment. Vehicle definition - Name, IP address, capabilities (move / load), current assignment. Users - Name, PIN code, allowed capabilities (vehicles permitted to drive etc.). Orders - Details of material, target weight, actual weight, required completion time, actual load times and operators. Recipes - Creation / editing of 'template' orders, simplifying the order creation process. 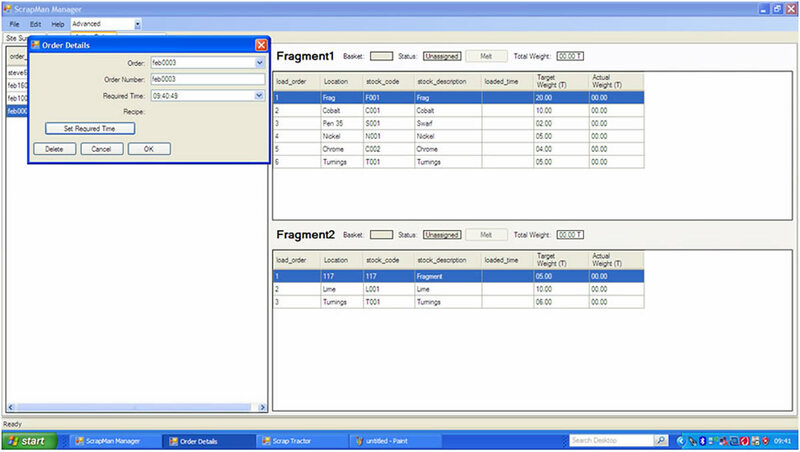 Interfaces - controls the ability of external IT systems interacting with the ScrapMan system, providing order requests and consuming completion reports.